The news that M&S is looking at launching its full food offer online will surely come as bad news to Ocado and Waitrose, who already operate in the upmarket segment of the internet grocery market. M&S's store-based food business is a strong and growing player and if it can replicate its appeal online it could rapidly win a big following. According to a press report in The Scotsman, it may use the move online to target younger customers, particularly millennials. However, there are solid reasons why this would be an unwise move. Millennials are simply not a growth market for grocery and if they are spending more on food, it is on restaurants and takeaways, not on food bought from supermarkets. 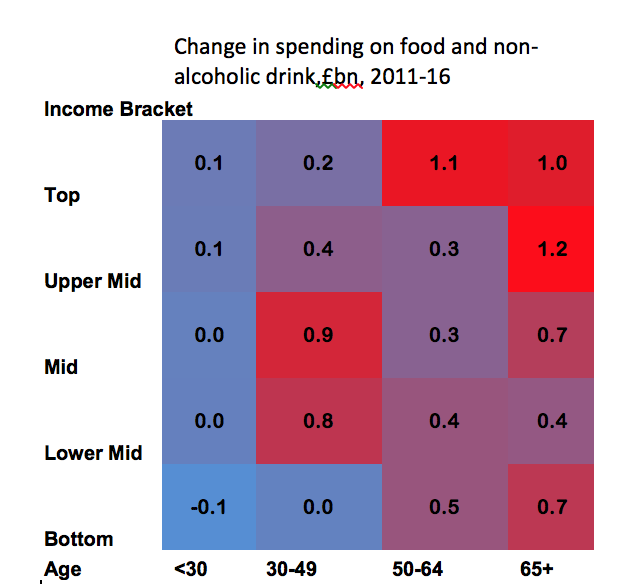 As can be seen from the heat map, apart from a 'hotspot' of less well-off family-age households, the big value growth in food is among the over-50s, particularly the upper middle and top income brackets. M&S would be wise to adopt a very high-service delivery model for its new online venture. It will only make money by appealing to the very top end of the market, aiming for those with large enough basket sizes to generate decent profit per order and probably levying high charges on this less price-sensitive audience. In fact, we can safely discount the idea of M&S targeting millennials: in food at least, it couldn't possibly make any sense.